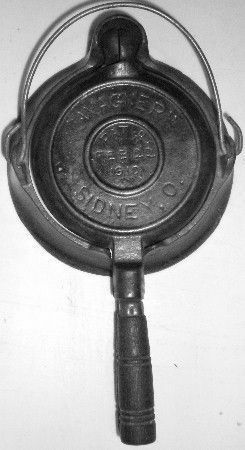 It's not something you would expect, but there are more than a few cast iron items circulating in the collectibles marketplace that are not genuine. 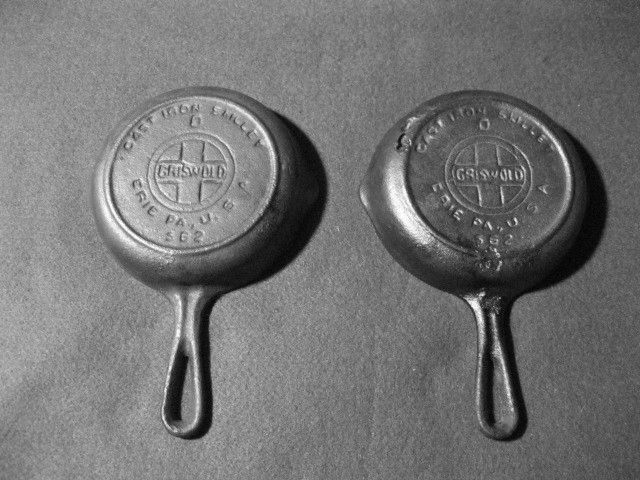 You can call them reproductions or copies, but terms like counterfeit, knock-off, and just plain fake are more applicable. 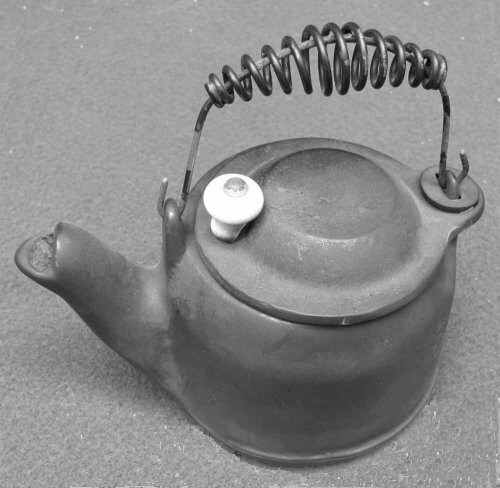 Many of these items exist in the form of cheap, poorly-made Chinese imports which cropped up in the late 1980s. 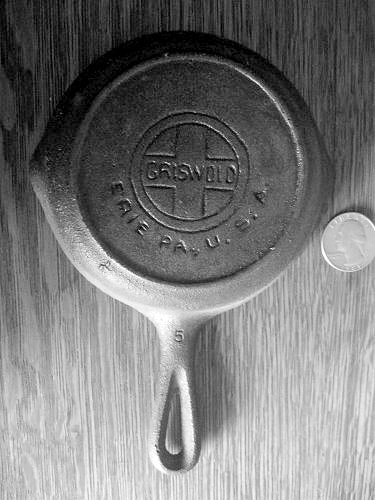 Some were sold via ads in Antique Trader magazine for $10 post paid. 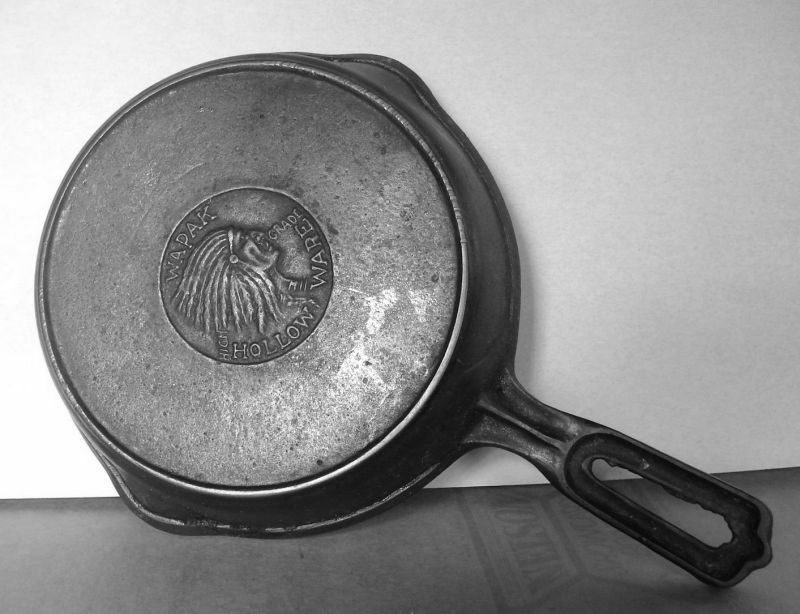 Others may have been around much longer, and might well be of domestic origin. 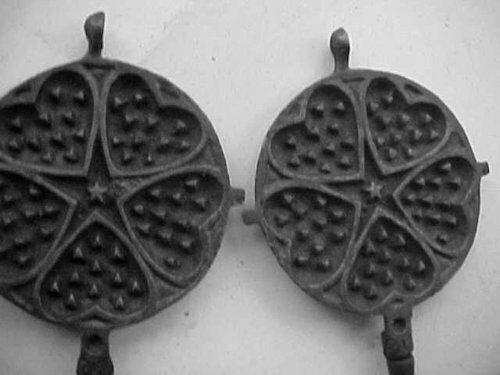 Often, those in possession of reproductions either don't realize they are counterfeits, or believe them to be genuine because they or someone they know owned them for a relatively long time. 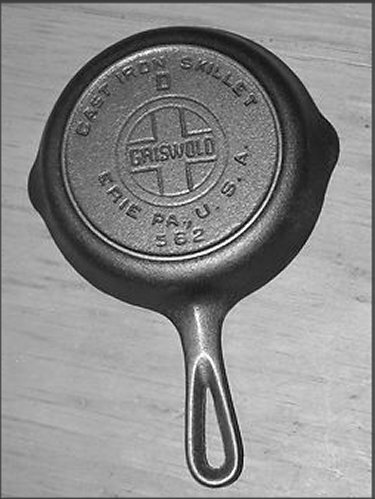 Fortunately, the majority of these "reproductions" are confined to small, novelty-sized items such as miniature skillets and waffle irons, which were originally made as toys (often seen described as salesmen's samples). 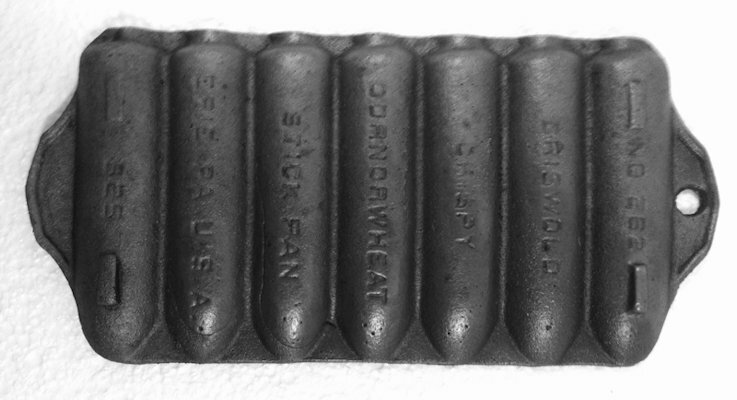 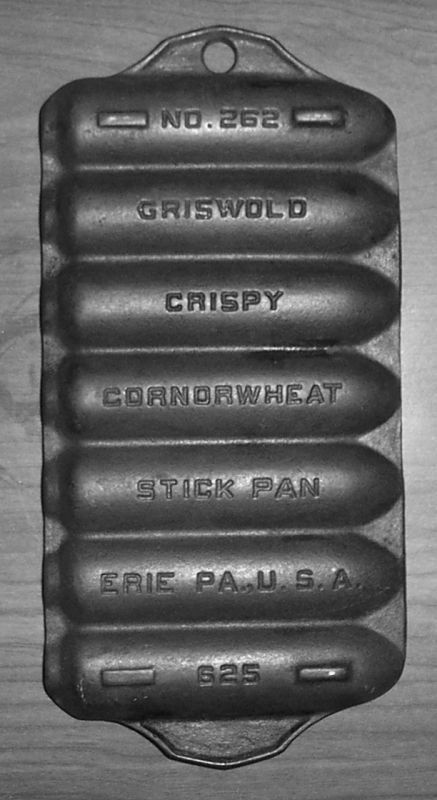 "Tea size" cornbread stick pans are also widely reproduced. 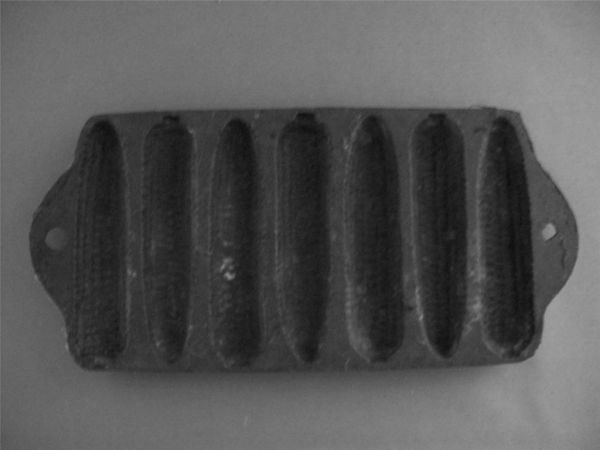 The counterfeiters obviously knew they could realize maximum profit on these small items whose genuine counterparts are among the more valuable as collectibles. 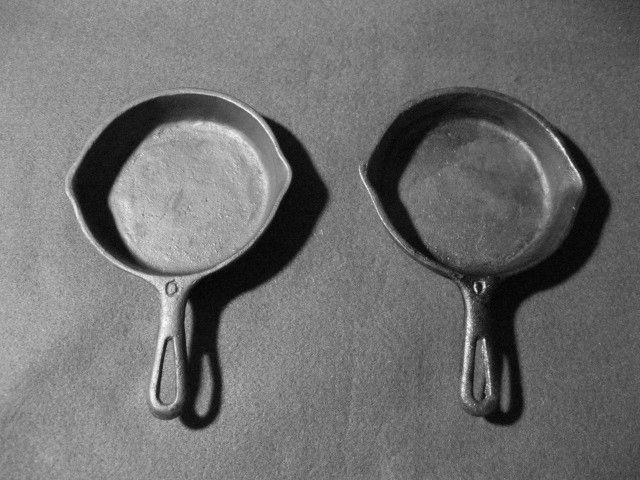 The poor casting quality exhibited by all, however, makes them easy to spot, once you are familiar with the superiority of that of the originals. 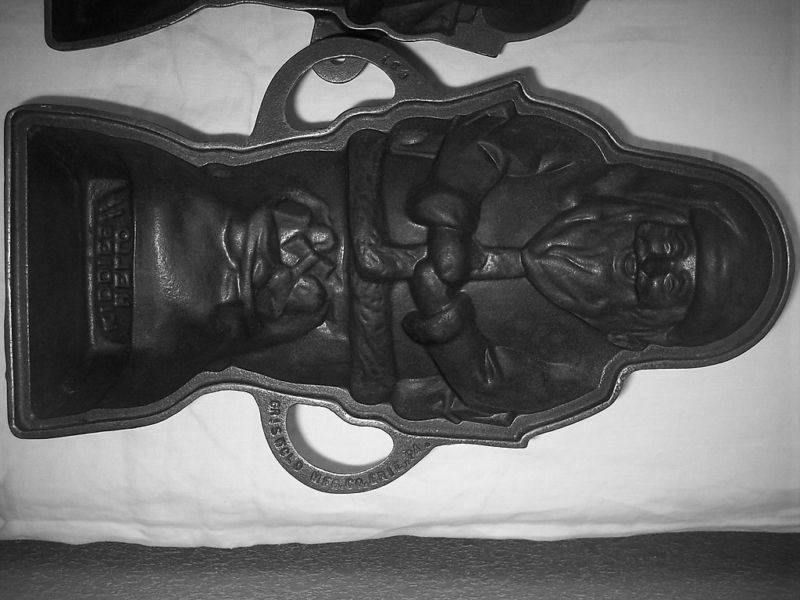 Sometimes harder to detect are copies of items like cake molds and "pup" paperweights. 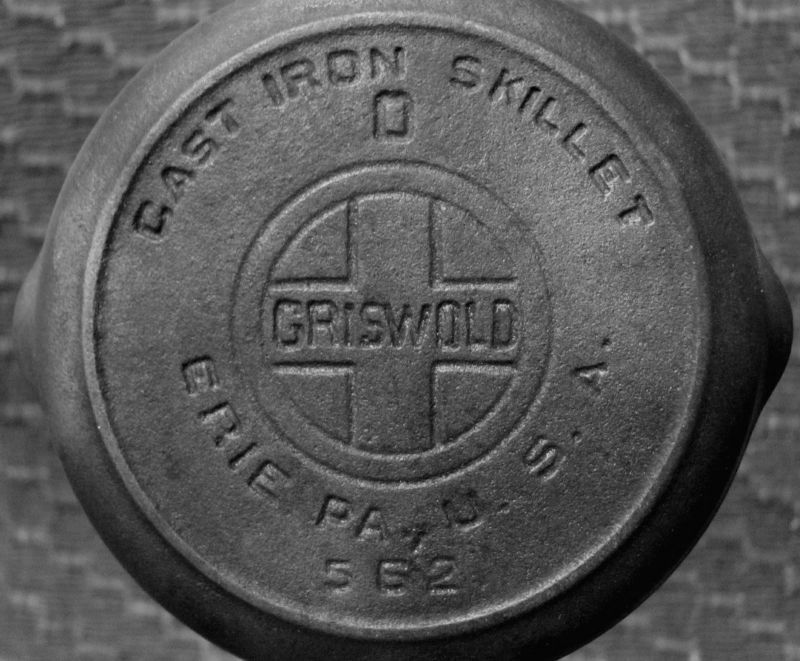 It's especially important to be able to identify these fakes, as the scarcity of the originals causes them to bring a premium price on the collectibles market. 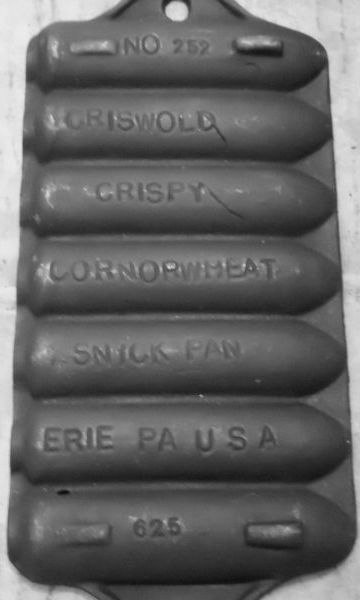 Also occasionally seen are what are known as "recasts". 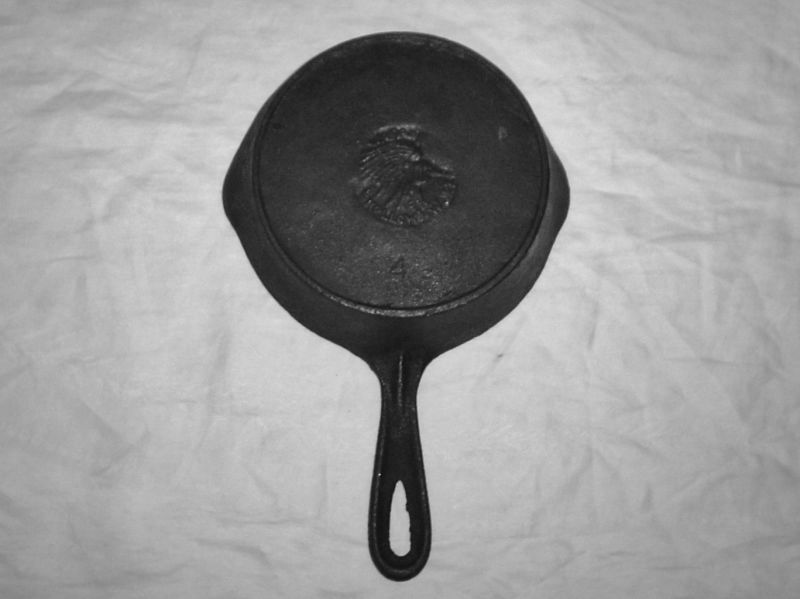 A recast is the result of an actual skillet or other piece-- as opposed to a pattern-- being used to create a mold to cast a pan. 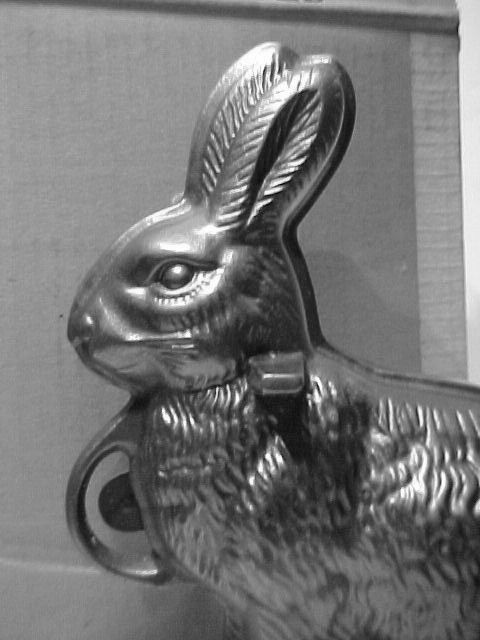 While some may just be the product of an individual trying their hand at metalworking, there are also those produced with the intent to deceive. 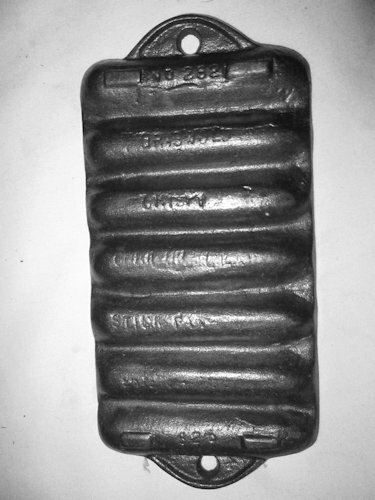 Recasts typically suffer from poor casting quality, with obvious casting flaws, size and weight disrepancies, and artifacts of the casting process not in keeping with the technology of the manufacturer of the original (primarily gate marks). 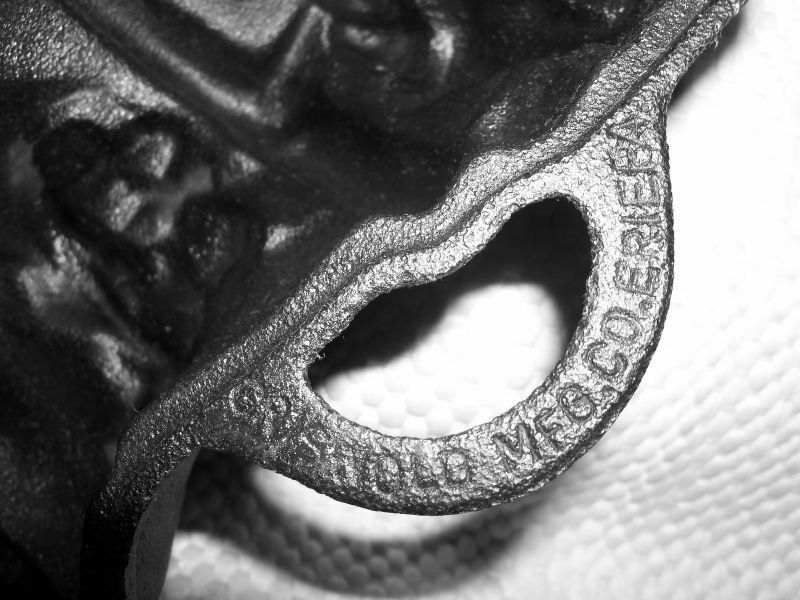 You should also be aware that there are some counterfeits for which a genuine original never existed. 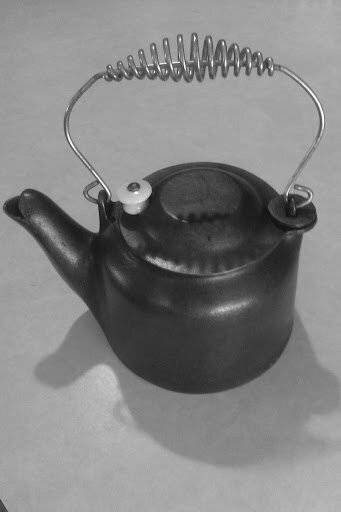 In other cases, the original is so rare that one must be immediately suspicious of any example encountered. 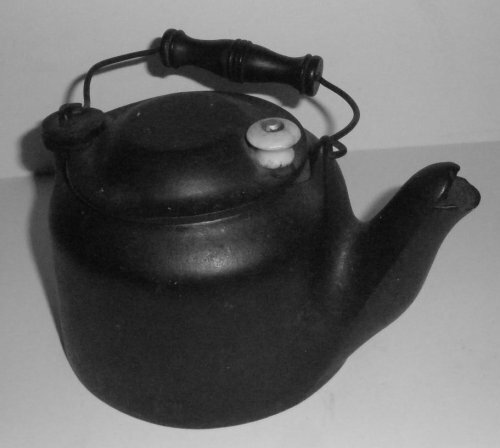 An experienced and wary eye is necessary to avoid being fooled by any of them. 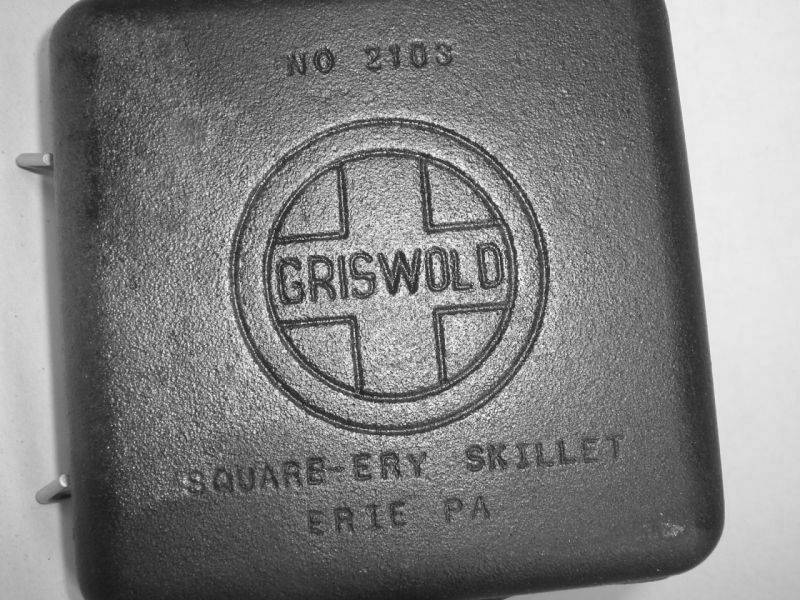 Also beware of fake Griswold alarm clocks and square wall clocks, for which no genuine versions exist. 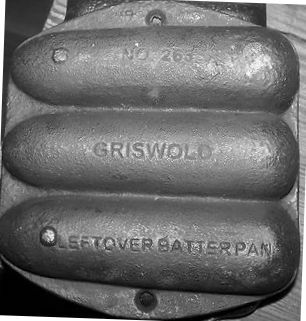 This is not to imply, however, that every pan marked Griswold or Wagner, etc, encountered should be treated as suspect. 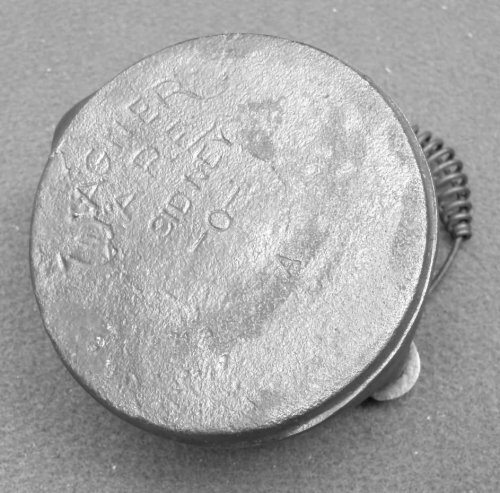 While there are several counterfeit pieces that surface from time to time, the following are the most often-seen. 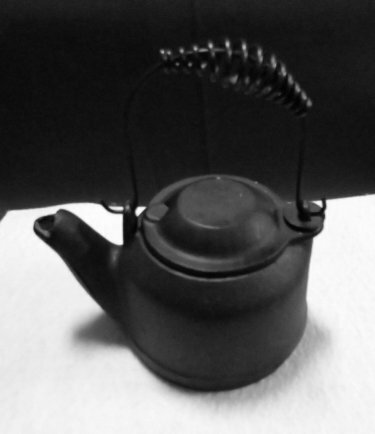 Click on any item with a icon for a gallery of photos. 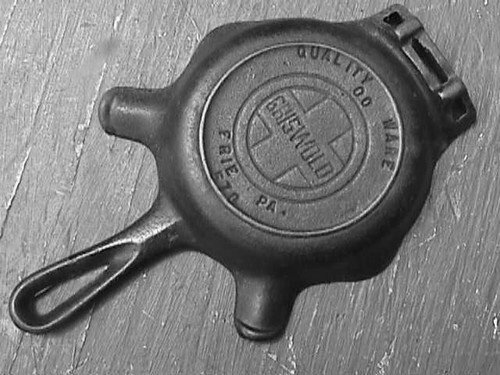 Fake has poor-quality casting, with 262 often mistaken for 282. 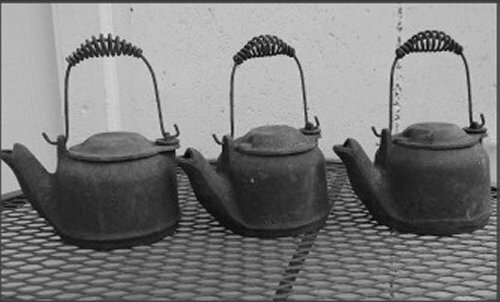 Compare handle edges with original. 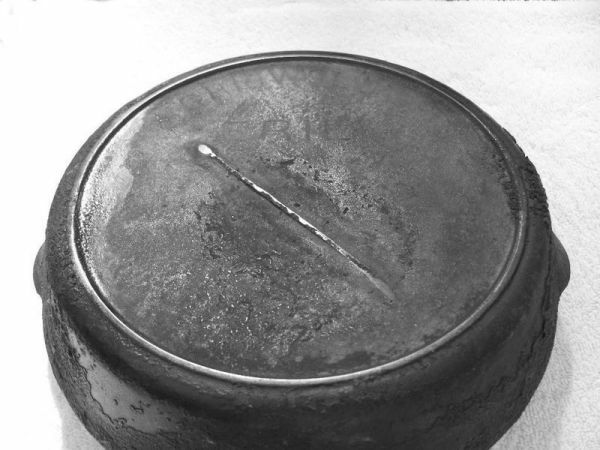 Pointed tips of sticks on bottom of original extend completely to edge. 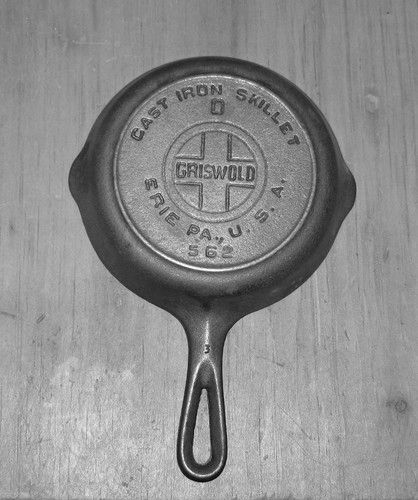 Some fakes have sloppy lettering, #282 or #252 instead, holes in both handles, or "stick" misspelled "snick". 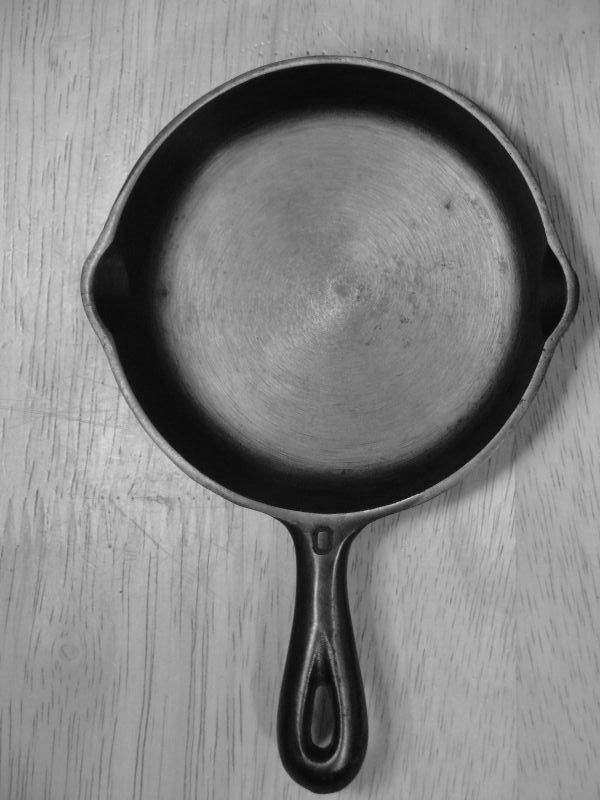 Fake has poor-quality casting, unpolished cooking surface. 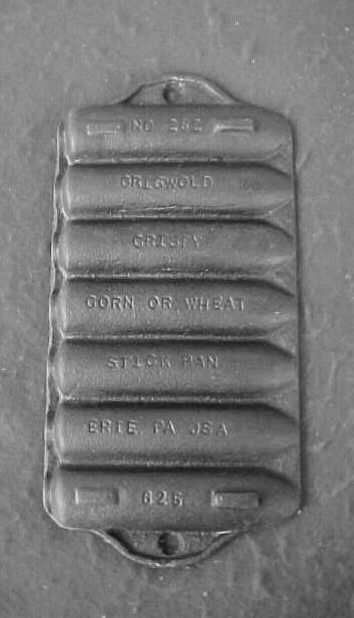 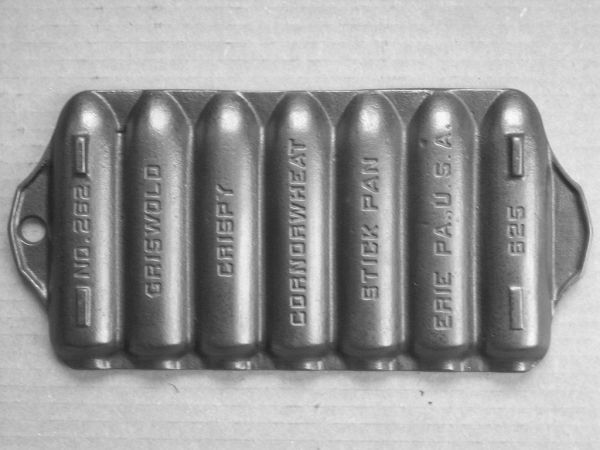 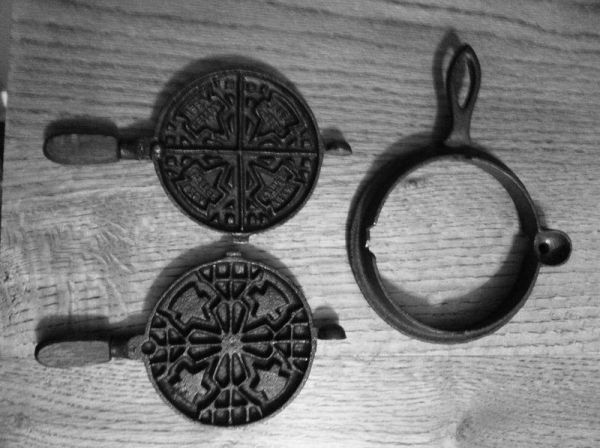 Many fakes have a sideways gang mold number outside the heat ring on the pan bottom. 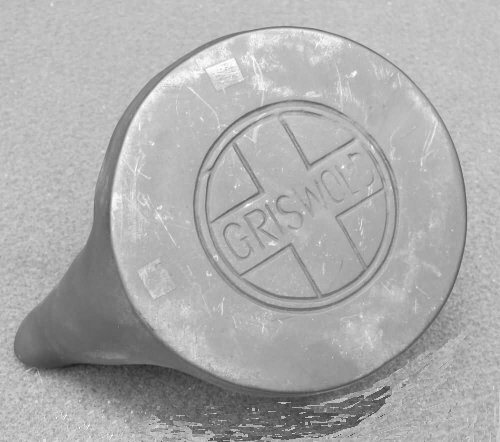 Pieces with the grooved handle should be inspected closely, as they are the most often-seen reproduced. 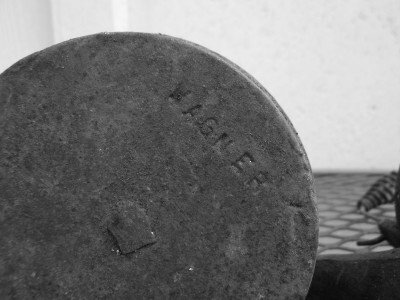 Fakes not fully marked, only have block logo, no writing, shaped much like the Wagner fakes. 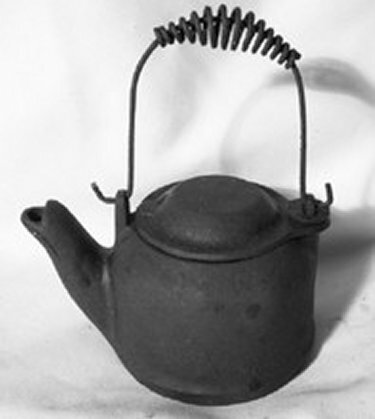 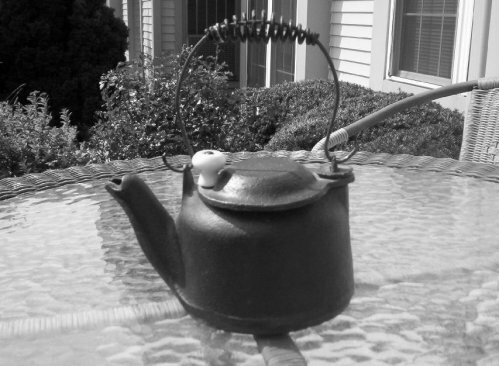 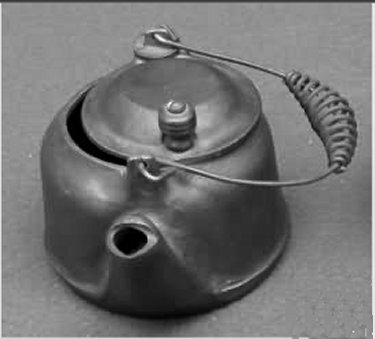 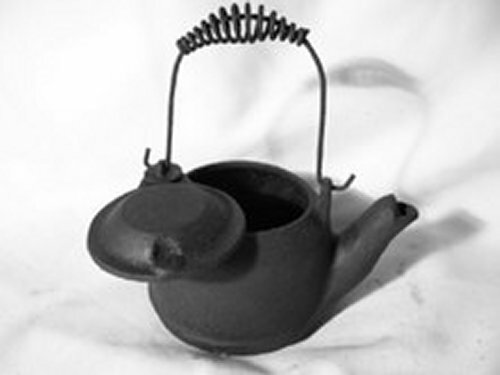 Original iron #0 tea kettles are of "colonial" design with faceted sides. 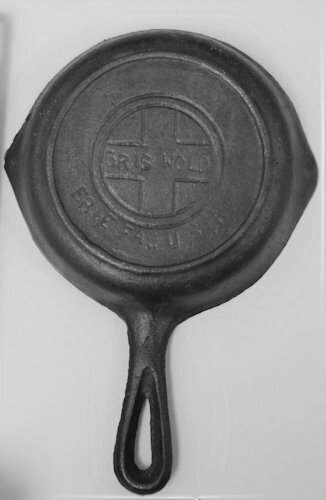 No original of this item exists. 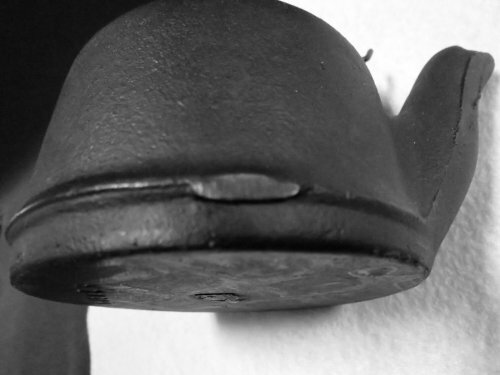 Poor casting quality. 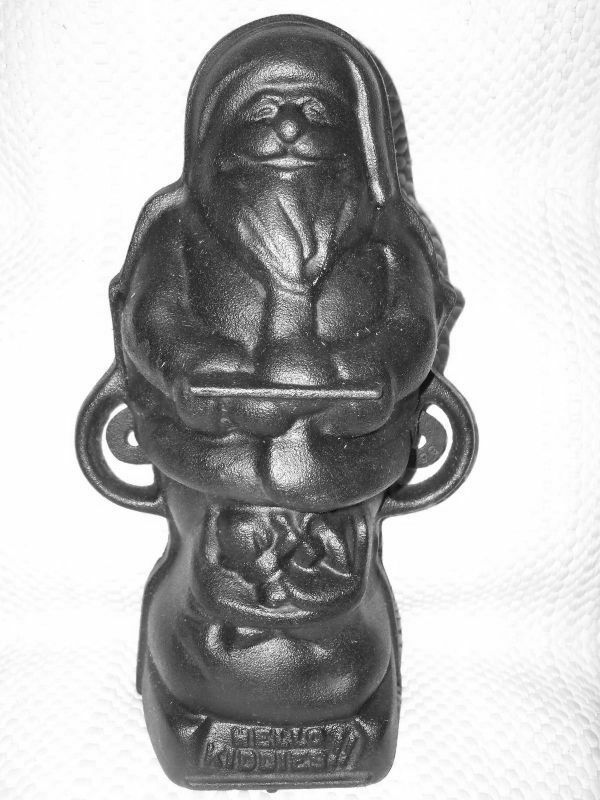 Original has pronounced tongue, and often has casting flaw in Santa's bag. 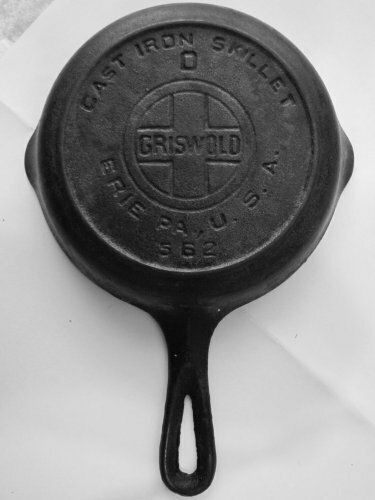 Fakes have rough casting, uneven margin below Griswold lettering. 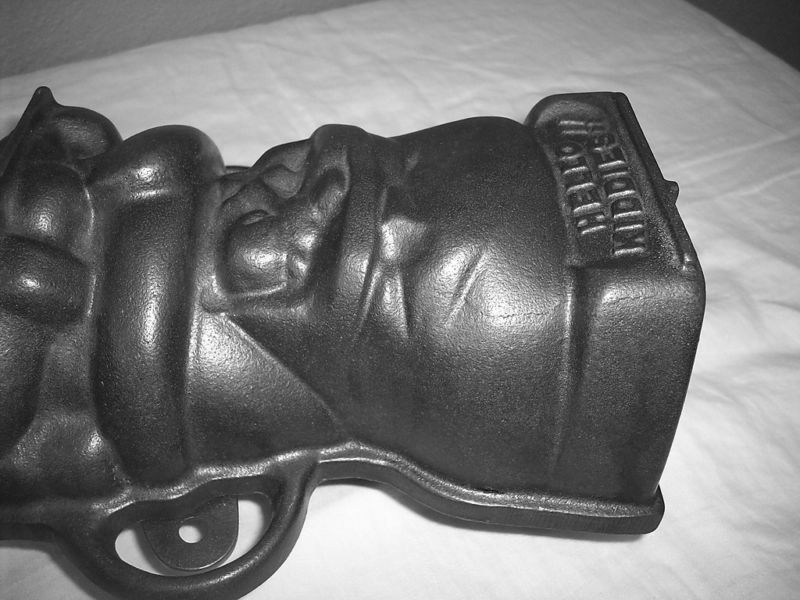 Original has finer detail, especially below the eye, and smoother casting. 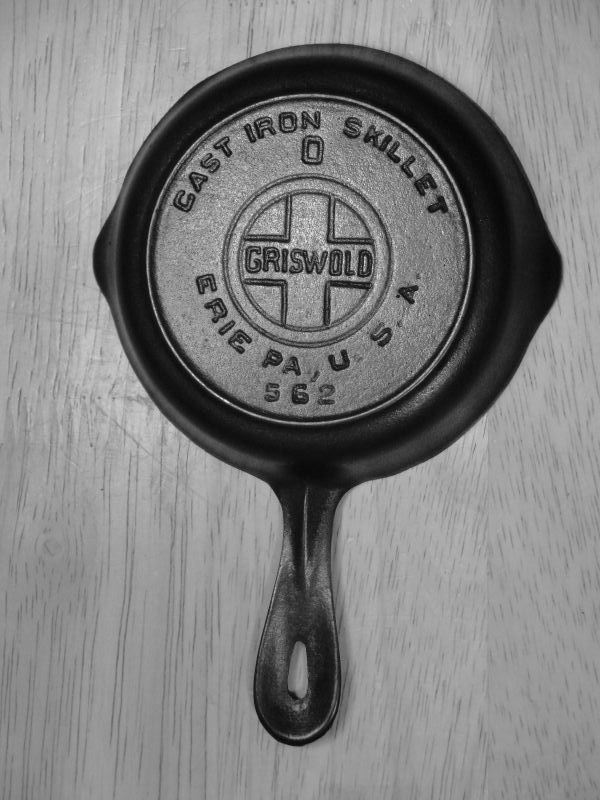 Lettering font on fake handle is sans-serif. 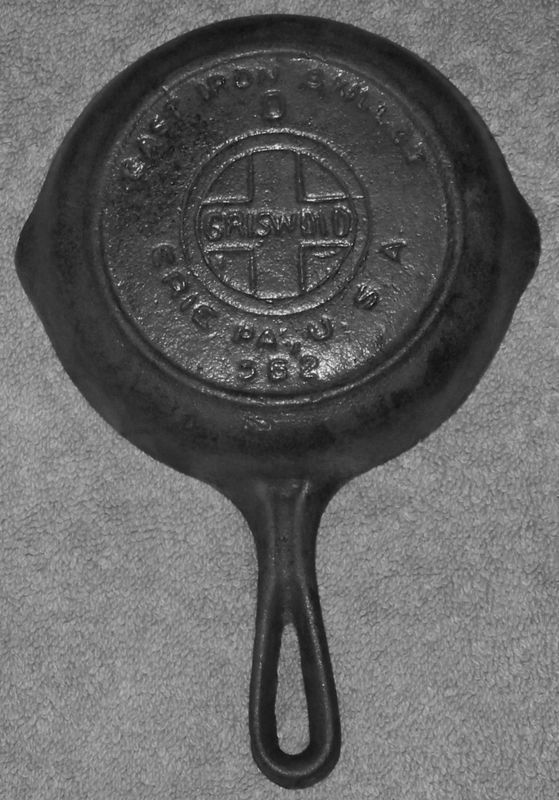 The numeral 3 on original has a flat top. 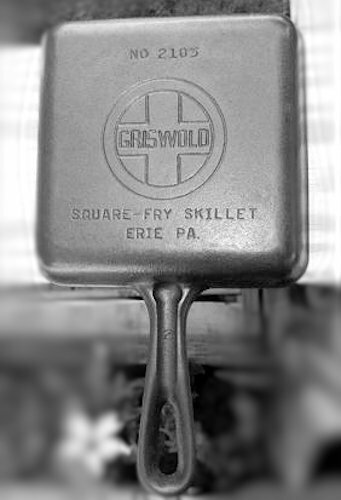 Square-Fry misspelled. 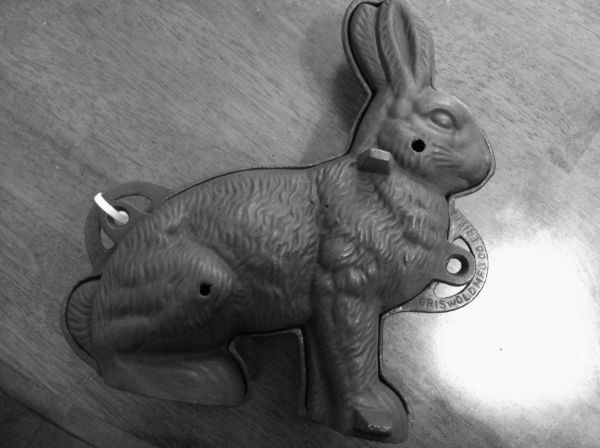 A collectible fake. 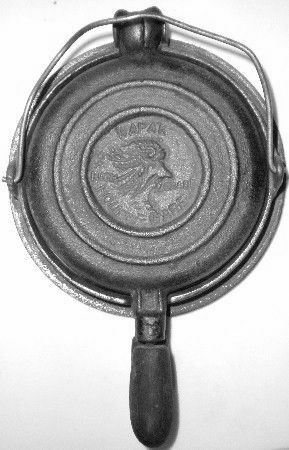 Not to be confused with the genuine, misspelled "Squar Egg" skillets. 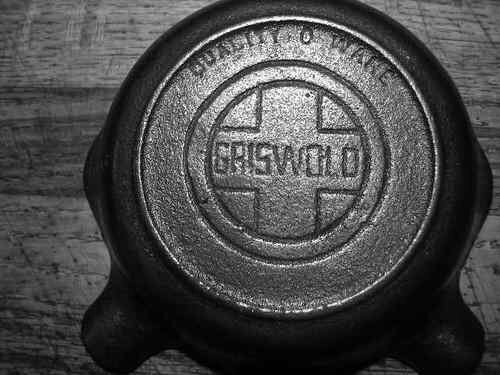 Griswold did not make this piece. 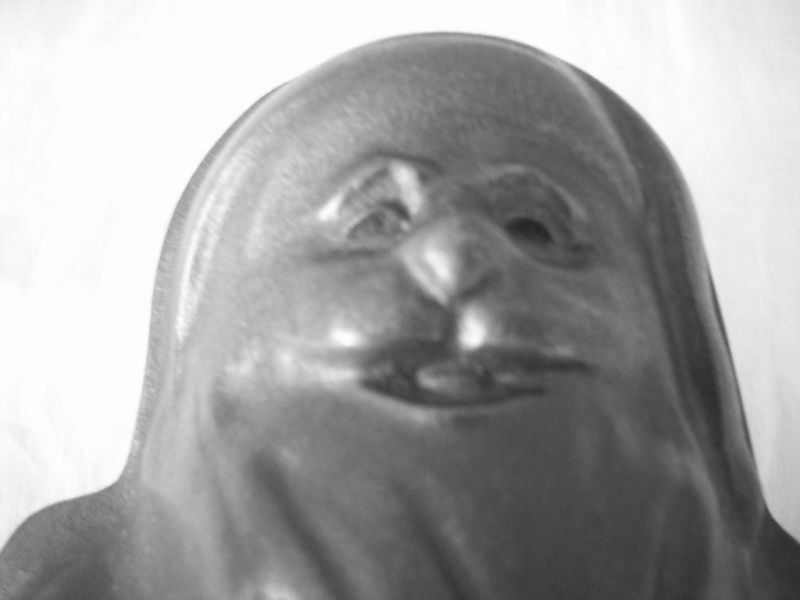 Poor quality casting. 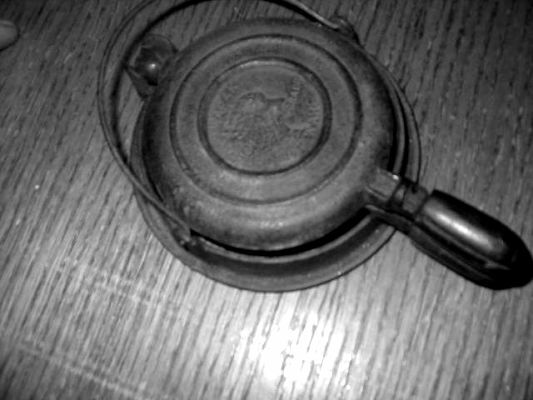 Original ashtrays always have match holders, fakes do not, although some without match holders may be from Wagner plant in Ohio. 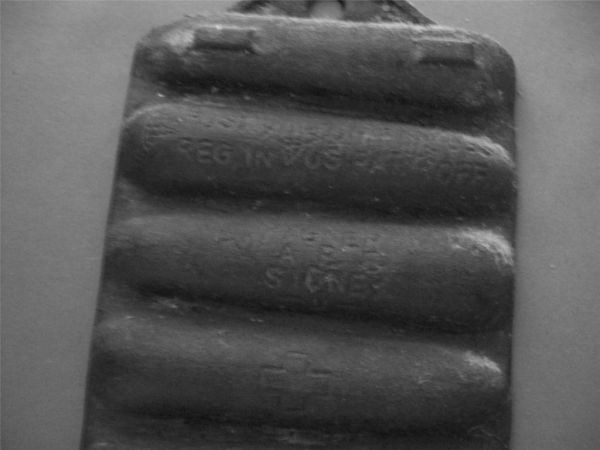 Those with markings on inside and no cigarette rests are not genuine. 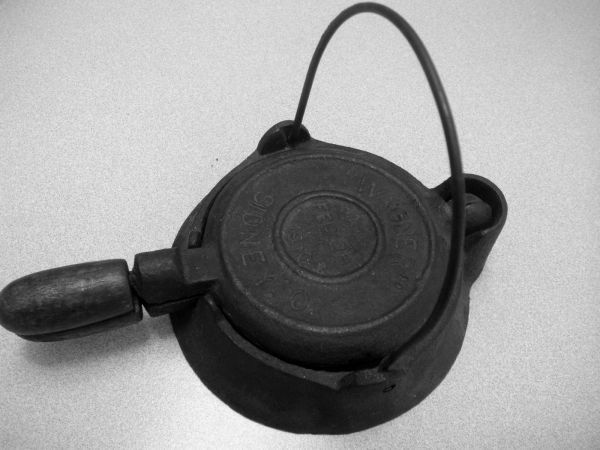 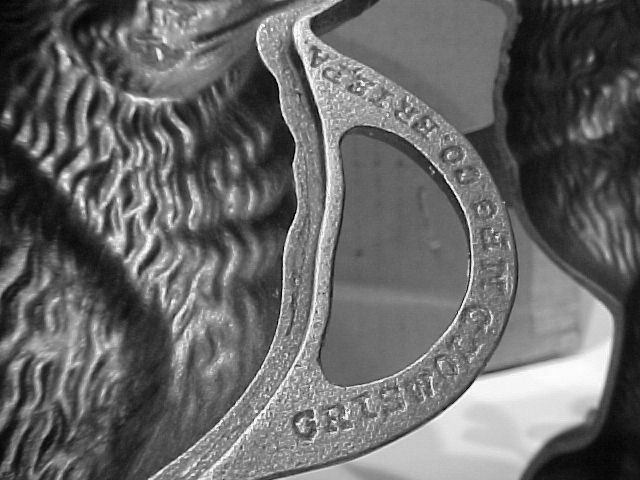 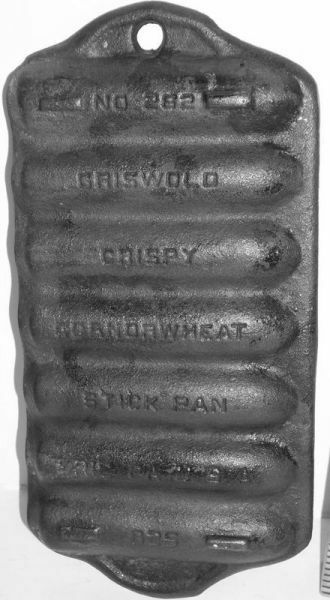 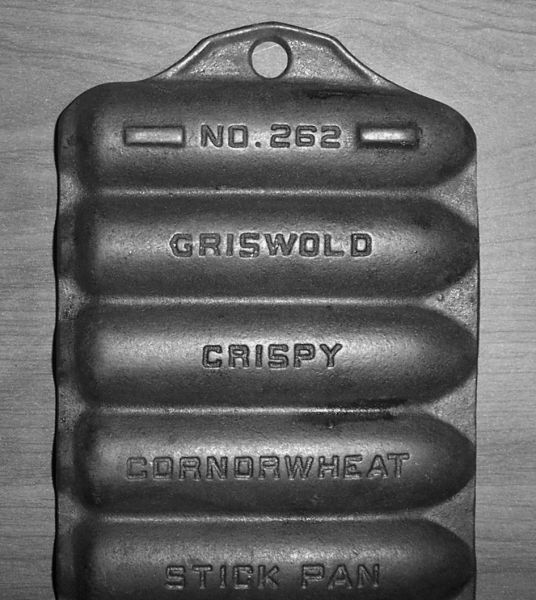 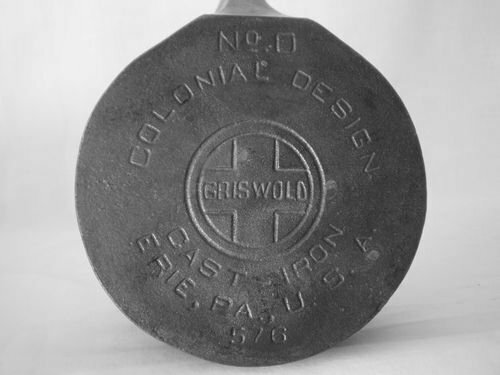 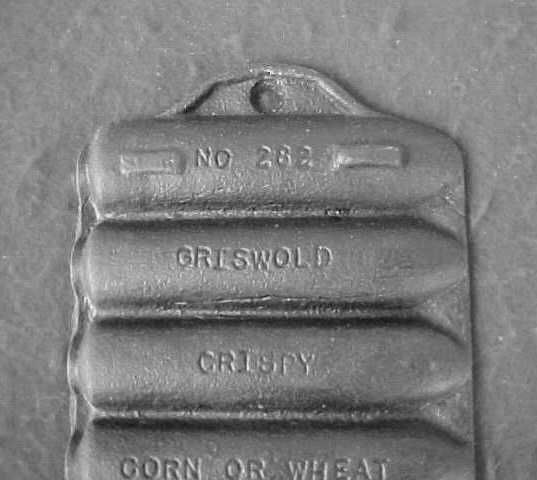 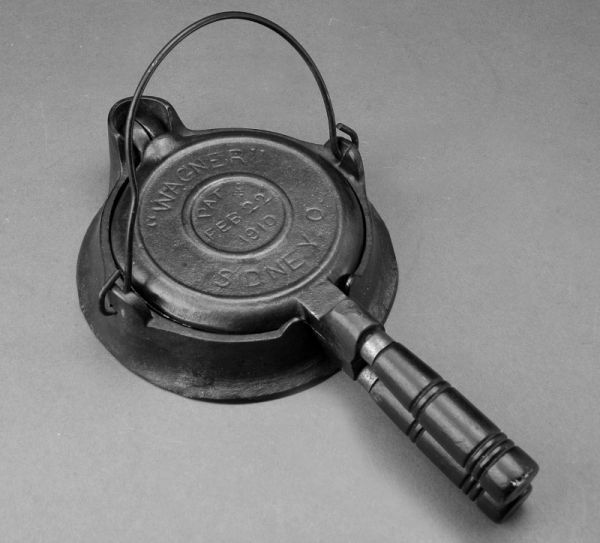 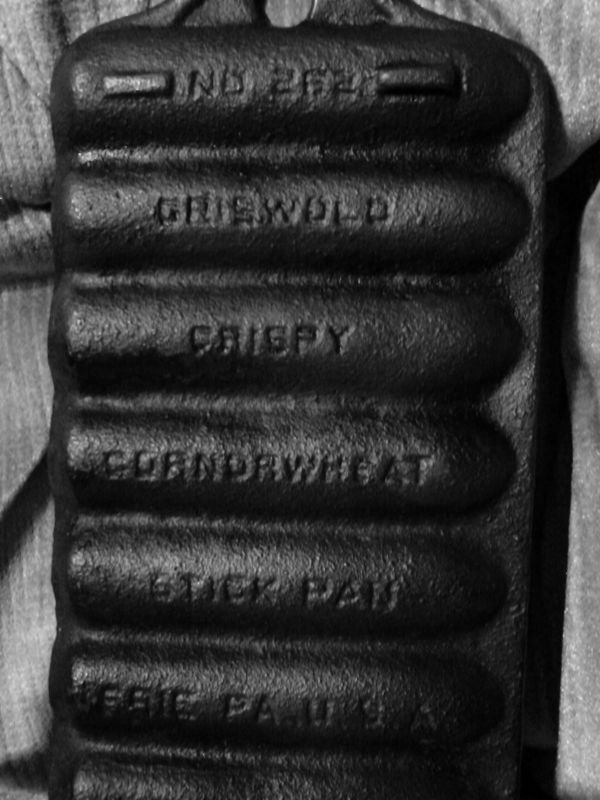 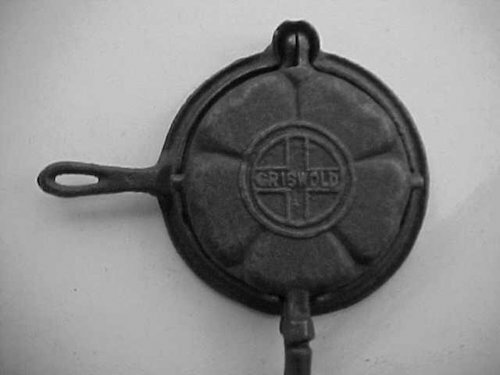 No original Erie or Griswold skillets were cast with bottom gating technology. 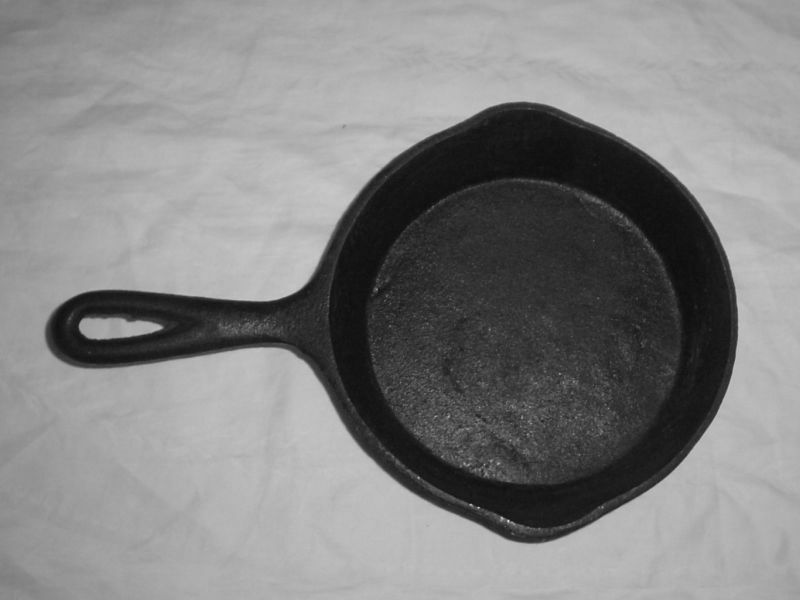 This pan actually sold for $100 at online auction. 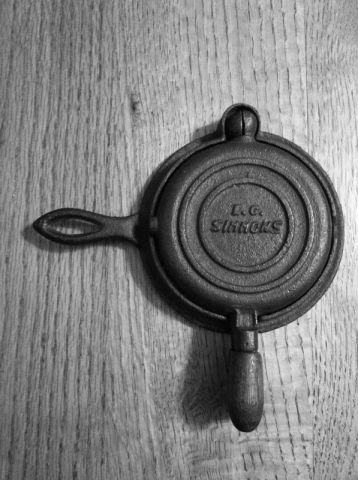 Simmons never made a toy waffle iron. 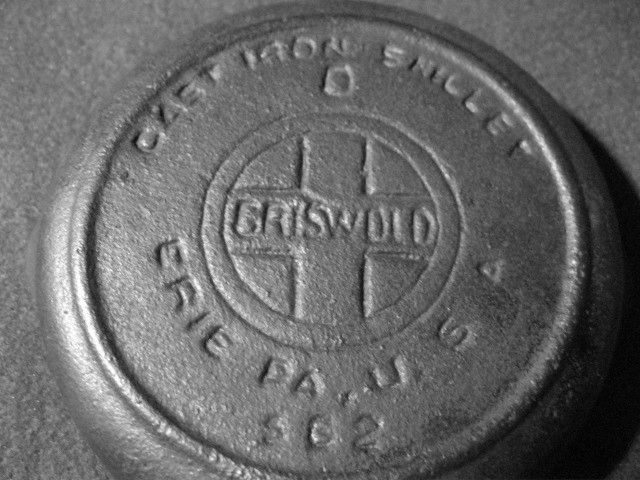 Fake has rough, poor casting, cross symbol, wrong c/n of #1818, or #1318, which is the c/n for an original "senior" size pan. 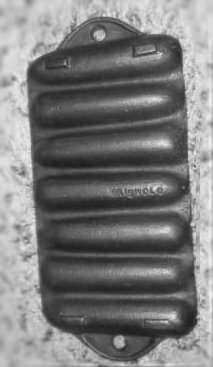 Fake has stubby handles and larger bail without fully-looped ends. 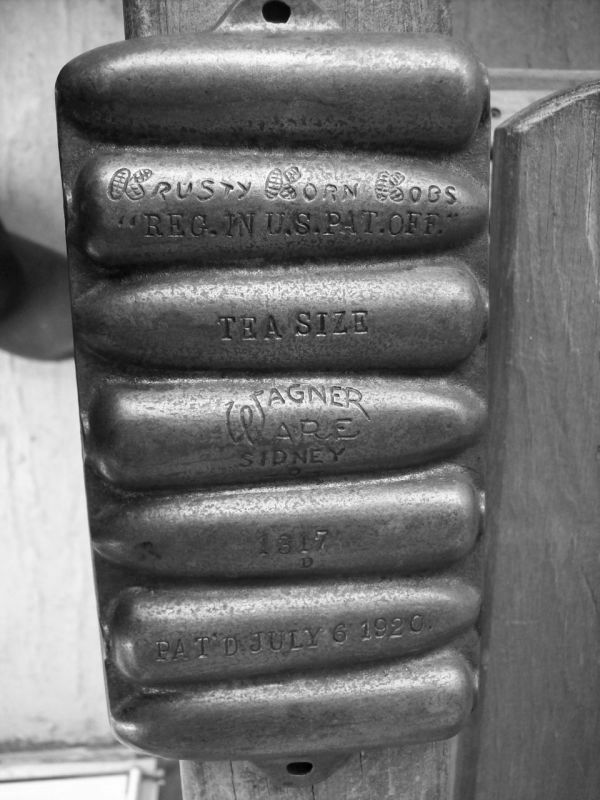 Occasionally seen are fakes with cast handles. 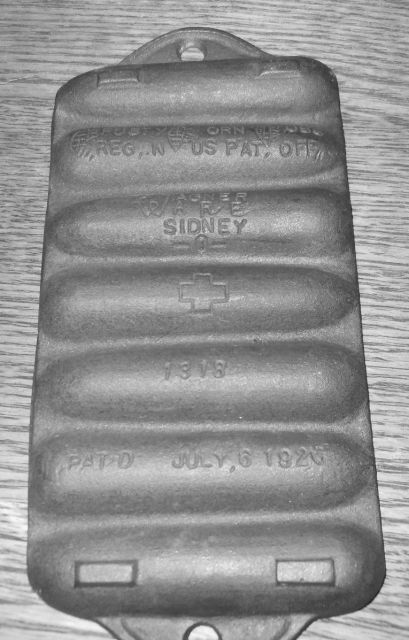 Bottoms of "22" in patent date curved on original, straight on fake. 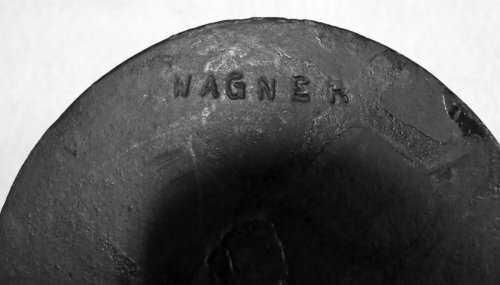 Bottom of "G" in Wagner T-shaped on original. 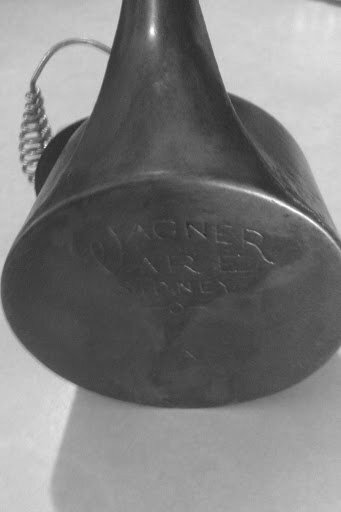 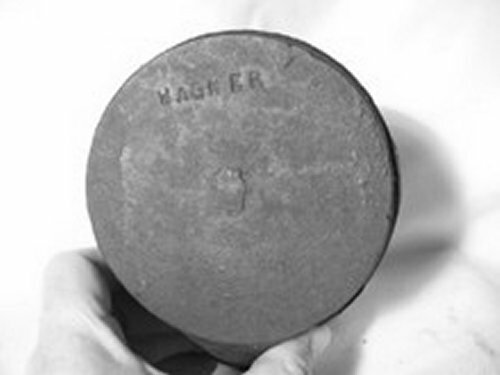 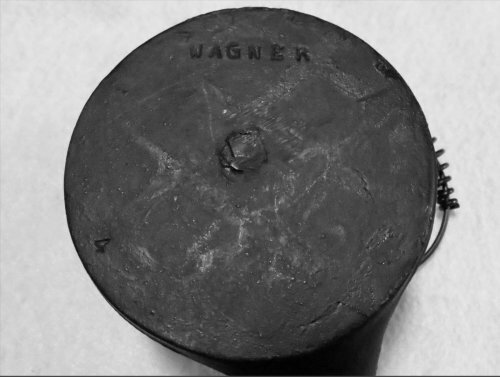 Fakes have one or more of: poor casting, bail attachment not fully looped, crude Wagner small block lettering, skewed letters in stylized logo, no knob on lid, knob secured with screw instead of rivet, sprue mark on bottom. 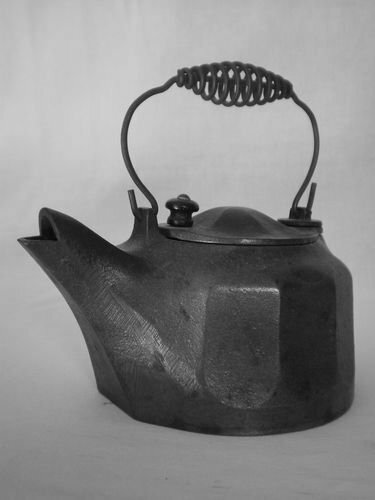 Originals may have coil or wood handle, and are made in bare iron, nickel plated, or aluminum. 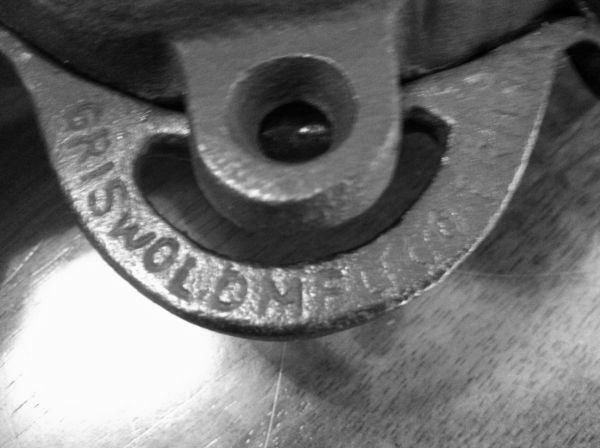 Fake has indistinct lettering not from wear, casting flaws. 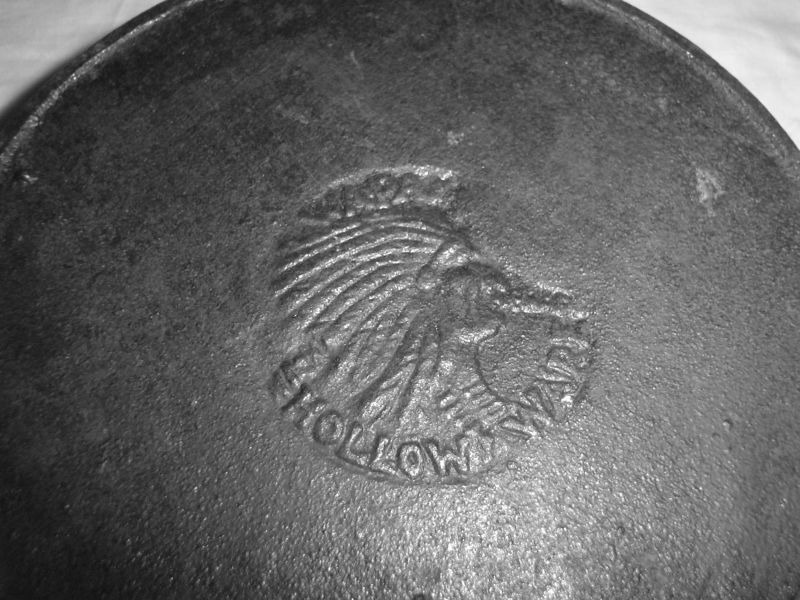 Indian may have large nose. 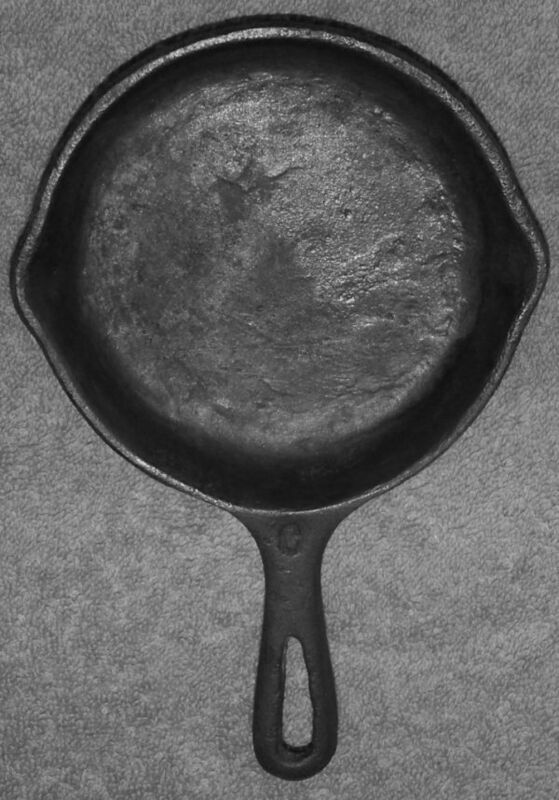 Handle may be plain teardrop shape, atypical of Wapak Indian Head series. 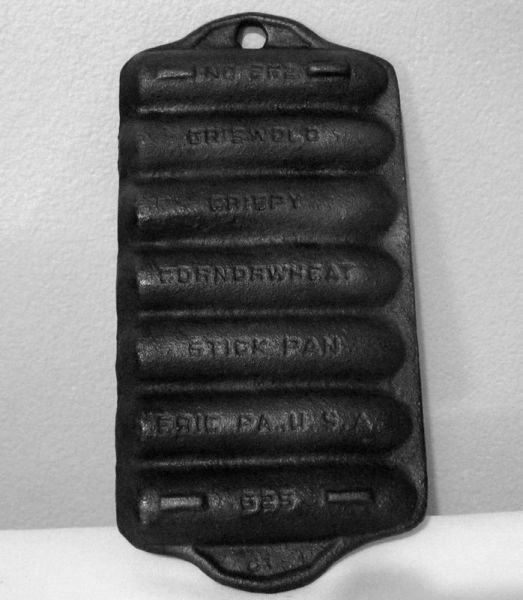 Wapak never made a toy waffle iron. 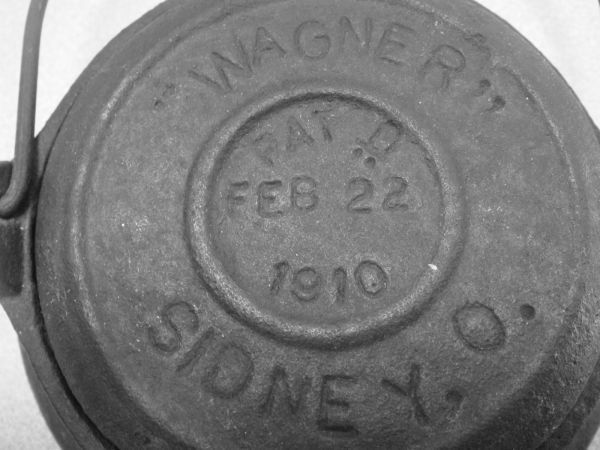 Design appears to be from same source as Wagner fake. 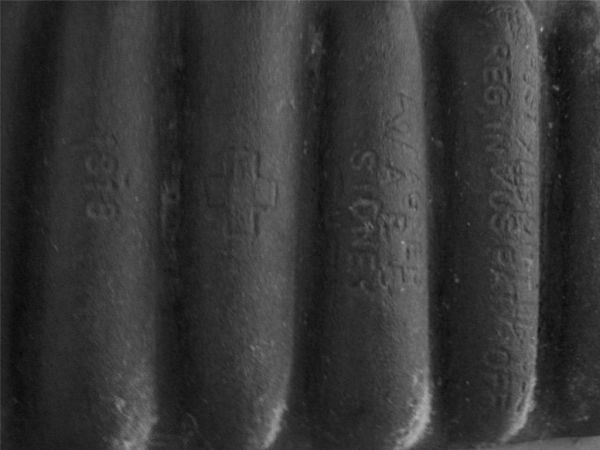 You may also encounter some pieces you might suspect are fakes, but are in fact genuine. 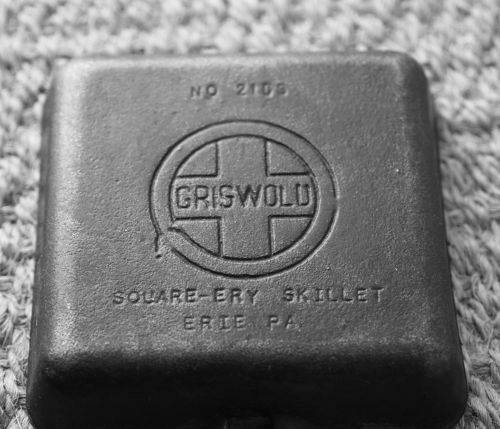 Two known errors on Griswold pieces include some Square Egg skillets misspelled "SQUAR EGG", and some slant logo dutch oven lids with the trademark spelled "GIRSWOLD".